Hokkaido Shinkansen having been completed, it has now better access from Tohoku. Why not go a little further from Tohoku and to Hokkaido? In Hokkaido there are many places of interest with the magnificent nature, but in this issue we will introduce fireworks, sport events, food event etc. Let’s participate in an exciting event while enjoying the nature of Hokkaido. You can enjoy Hokkaido twice. 2017 makes the 36th year of firework. As the name “long-run” goes, skyrockets color the night sky of Lake Toya for about 20 minutes during the period from 28th April (Fri) to 31st October (Tue). Since there are different charms for seasons from the spring to the autumn, it is fun to visit in different seasons. Especially during the summer festival in August, the town is much crowded by tourists and there are stalls on the street. This year, on 22nd July you can see 108 non-stop submerged fireworks, on 25th August five non-stop big submerged fireworks. You will enjoy very powerful fireworks. The fireworks are launched one after another from the boats on the lake and make big flower-like flashes in the night sky. Among them, the submerged fireworks being launched from moving boats, spread out in a fan shape on the surface of the water. You can see them from everywhere in Toyako Onsen town. Also, we recommend not only seeing from the ground but also “Cruise behind the fireworks”. 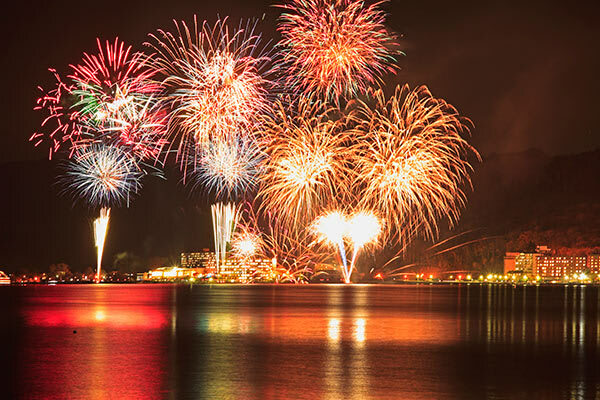 It is viewing the fireworks on the boat and is the big attractions of the Lake Toya’s “Long-run Fireworks”. When you go to Lake Toya, please check it up only sightseeing but also the Firework Festival. 28th April, 2017 – 31st October, 2017, 8：45p.m. – 9：05p.m. 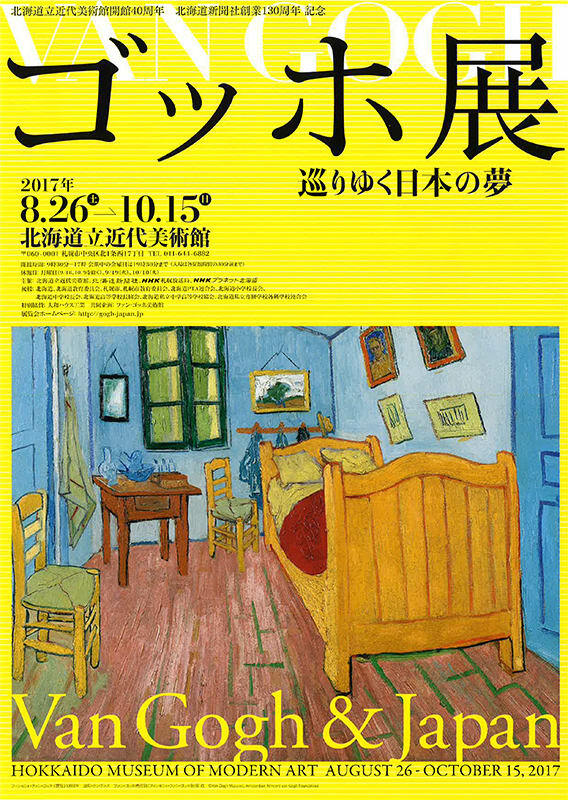 “The dream of Japan – Gogh exhibition” is currently taking place at the Hokkaido Museum of Modern Art. Van Gogh is a highly popular painter in Japan who was influenced greatly by Japanese art including Ukiyoe and accomplished various works throughout his life. This exhibition consists of two parts, “Japonism with Van Gogh” and “Pilgrimage towards van Gogh by Japanese”. In addition to about 40 oil paintings and drawings of Van Gogh and 50 paintings of artists of the same period and Ukiyoe, we verify the relationship between Van Gogh and Japan bi-directionally through related documents. The Hokkaido Museum of Modern Art was opened in 1977. Distinguished works in various fields mainly arts in Hokkaido after the Meiji Era , are systematically collected and displayed. In addition to paintings, glass arts and the works by the artist of the Paris School in early 20th century, such as the Bulgarian painter Pascin, are diligently collected. Furthermore, various lectures, courses, commentaries in relation to the exhibition as well as a question session where volunteers answer to questions about arts, are also set up. In the vicinity of the Hokkaido Museum of Modern Art, there are the Hokkaido Migishi Kotaro Museum of Art, Hokkaido Jingu Shrine, Odori Park, and so on. Why not combine both and enjoy sightseeing and arts together? The annual “Akkeshi Oyster Festival” will be held this year, too. Many store will be opened in the venue. Besides marine products such as oysters and clams, sauries, scallops you can also buy oyster ramen (noodles), Oyster lunch boxes, clam soup, etc. On Sundays during the festival period, various events such as “Chibikko Asari Tsukamidori” (children grasping clams as much as possible by hand), “Akkeshi Kaki no Tsukamidori” (grasping oysters as much as possible by hand) and stage shows take place. 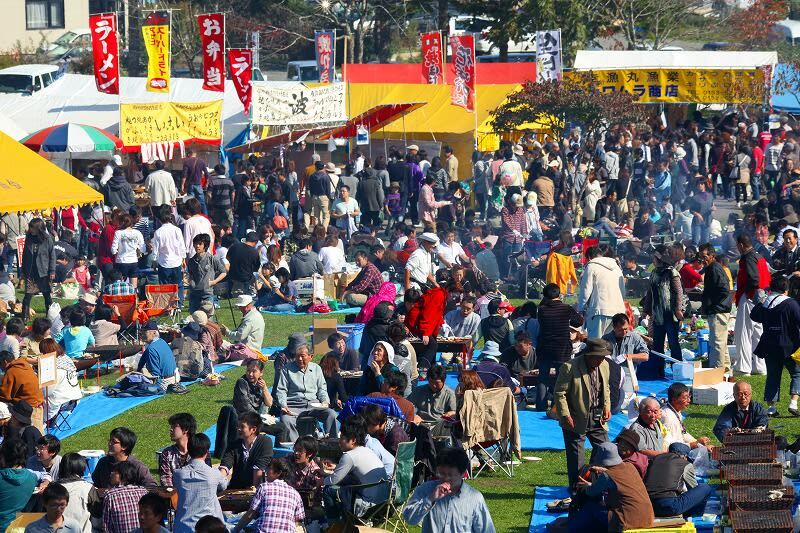 Particularly, “Akkeshi Kaki no Tsukamidori” of “Teppan” (cooking iron plate) event in the Oyster Festival is extremely popular. Junior high school students or over can participate in the event. Speaking of autumn’s taste, it is surely a saury. There is also “Sanma (saury) no Tsukamidori” (grasping sauries as much as possible by hand) arsping grabs of saury The sauries are caught in the offing near the “Akkeshi Daikoku-jima” Island. Let’s enjoy the taste of autumn here. The oyster is a symbol of Akkeshi-Cho situated in Akkeshi County, Hokkaido. It is said that the name of the town derives from “atkeusi” in Ainu language, meaning a place to peel “Ohyonire” (a kind of elm tree). Not only eating, but why not also take a walk in the old town which used to be the central town of the Ainu of eastern Hokkaido? Gondolas at Sapporo International Ski Ground run especially for “Autumn leaves gondola” during the autumn leaves season only. The gondola runs slowly from the mountain foot at 630m of altitude to the mountaintop at 1,100 meters in 15 minutes. 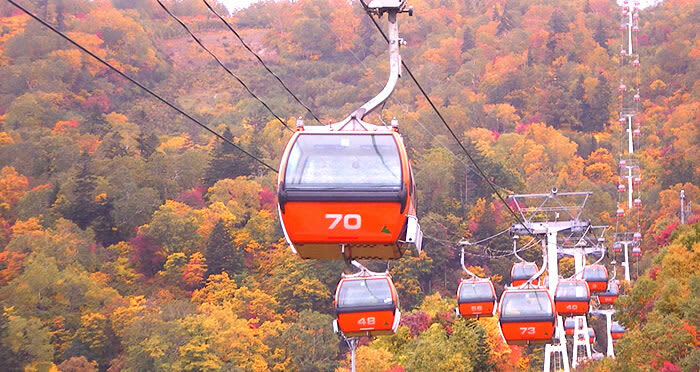 The autumn leaves gradually start coloring from the mountain foot to the summit because of the difference in temperature, so you can see the beautiful gradation from the gondola. It gives you a different attraction than the coloring at the same time. Not only from the gondola, but also from the summit, you can see the spectacular panorama and when it is a fine weather you can see as far as the Ishikari plain and the Ishikari bay beyond the mountains. At the promenade near the summit there is also a view spot that overlooks the Otaru Bay. Let’s enjoy a wide panorama. There is also a cafe “Cuckoo” on the top of the mountain. It is nice to have a rest with coffee and doughnuts while overlooking the autumn mountains. Let’s go to see the beautiful scenery of autumn leaves only for the season. Senior 65 years or over: Yen990 (inc. Tax) ※Please show ID to prove the age. In Ozora Town, sunflowers are planted as field fertilizer after harvesting wheat. Because sunflower seeds are inseminated after summer harvest, blooming of the sunflowers is very late and therefore the best time to see flowers is between late September and mid October. You can enjoy sunflowers until the autumn. In the town around Asahigaoka Park and the airport there is approximately 10 hectares of field in total for sunflowers. Two millions sunflowers! The sunflowers here are about 1 meter tall unlike the tall sunflowers in Honshu. However, the view with so many sunflowers in bright yellow all over is breathtaking. Many tourists visit here from the airport and are surprised by the view. 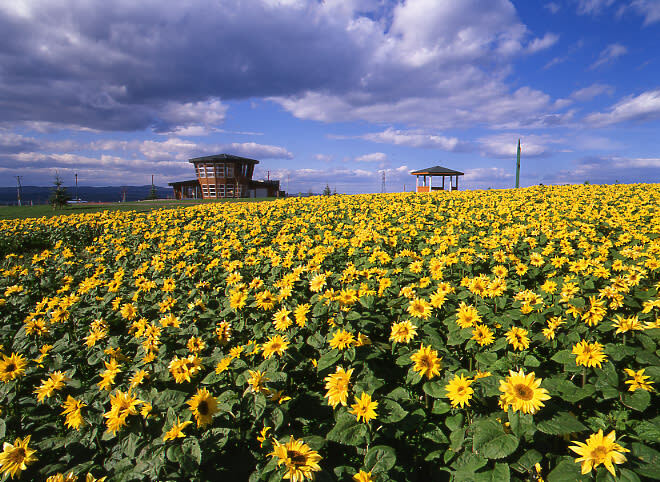 You can have a spectacular 360-degree panorama as far as Lake Abashiri, Mount Sari and the Shiretoko mountains from Asahiogaoka Park situated on the hill of Memanbetsu, where the sunflower fields are. At the observation deck in the park, you can feel the refreshing breeze from the Okhotsk. The park is recommended for your leisure as there is a park golf course. There are also tourist attractions in the area, such as the Abashiri Prison Museum, “Michi-no-Eki” (a road station) where you can buy souvenirs, “Meruhen-no-Oka Memanbetsu” (a hill of fairy tales), the Okhotsk Ryuhyo (drift ice) Museum, the Hokkaido Museum of Northern People”. Let’s check out these attractions along with the sunflowers. The “Satsuki Blossom exhibition” to enjoy azaleas which has been loved in Japan for many years, will be held at the Green Center in the Toyohira Park. 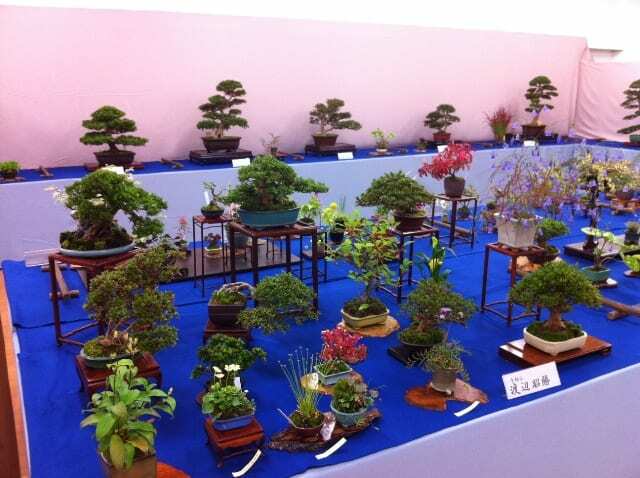 There will be exhibitions of Bonsai of azalea by experts, in collaboration with Sapporo Satsuki Kyokai (an association). The azalea flower has many varieties of color. Also there is so called “Sakiwake” which means variegated flowering where heterochromatic flowers bloom on one stock. There are works of flowers covering the tree fully and you can thoroughly enjoy colorful flowers and beauty of the shape of a tree. In Hokkaido flowers bloom a half month later than Honshu so that there are flowers with adjusted blooming timing in the exhibition. During the exhibition period, the consultation by the member of the Association is available. Toyohira Park, a venue of the exhibition and with variety of flowers and green, is close to the subway station. It has a surface of 7.4ha and there are “Hanaki Garden” with various roses, “Coniferous Tree Garden” with coniferous trees from many countries, a play ground for children, tennis courts (at a fee) and so on. In the Green Center with 2-story greenhouse for exhibitions, there is a permanent information area where horticultural classes and lectures are held. Services to intermediate trees and flowers which become unnecessary are available so that you can learn more about plants and flowers while enjoying them. Let’s spend one autumn day at Toyohira Park and appreciate azalea Bonsais. 9:00a.m. – 5:00p.m. the last day until 3:00p.m. 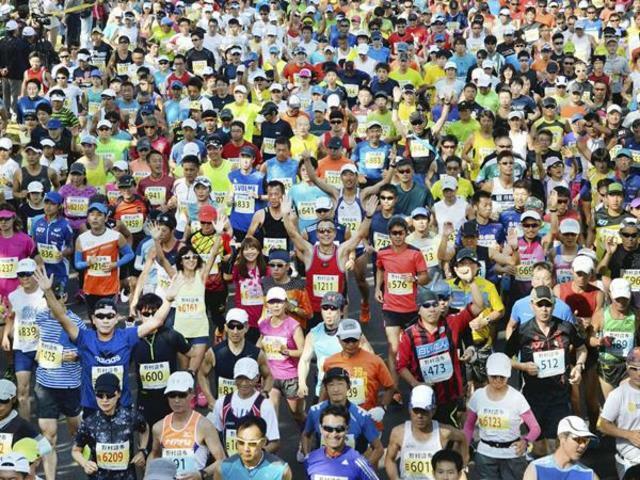 Other than half marathon and 10km-run recognized by JAAF (Japan Association of Athletics Federations), there are 5km, 3km, a 2km course to run in the park. The 3km and 2km runs also have “Fun-pair” runs with children (elementary school students or under). In addition, 1km-wheelchair was introduced this year for participants with wheelchair. Not only top class invited runners but also citizens, high school students, children and participants with wheelchair, will take part in this event. Other than invited runners we have guest runners. This year our special guest runner is a celebrity, Wakana Fukushima. She completed the whole race in Tokyo Marathon in February this year in 2hours 57minutes 51 second. It was a topic that she ran a full distance within 3hours and qualifies her within top 0.4% among female runners. Also she renewed her own record. The entry for this year is already closed, but it is worthwhile watching runners run through the city. Why don’t you cheer them up! Time depend on the race.